As I may have mentioned before, I am very cheap frugal. Our city doesn’t provide garbage service so each household is responsible for contracting their own service. There are four or five different companies that provide service to my street (and unfortunately, four or five trucks that drive down my alley every week because of it) so there are a lot of options for trash pick-up. Most of the companies offer recycling as part of their fee but they only take number one and two plastic so I haul all my recycling to a drop-off site that takes batteries, small corded appliances, glass, cardboard and paper, metal and ALL plastic including numbers 1-7, plastic bags and STYROFOAM. Recycling all that “junk” eliminates a huge chunk of my garbage output. Compost takes care of another chunk. Because I compost and recycle most of my garbage, my family of four creates less than one eight-gallon garbage can full of trash a week. So, why would I pay $10 or $20 a month to have that little bag hauled away every week? A couple of the garbage companies offer a “pay for what you use” plan for garbage. You buy the color-coded bags from them (ten bags for $25) and only put out the garbage when you fill the bags. I can fit three or four of my little garbage bags into one of their big bags. If you do the math, that works out to about $2.50 every three-four weeks. This ends up costing me under $50 a year instead of $120 or more. So, even if I didn’t use my compost in the garden, it is worth its weight in gold! 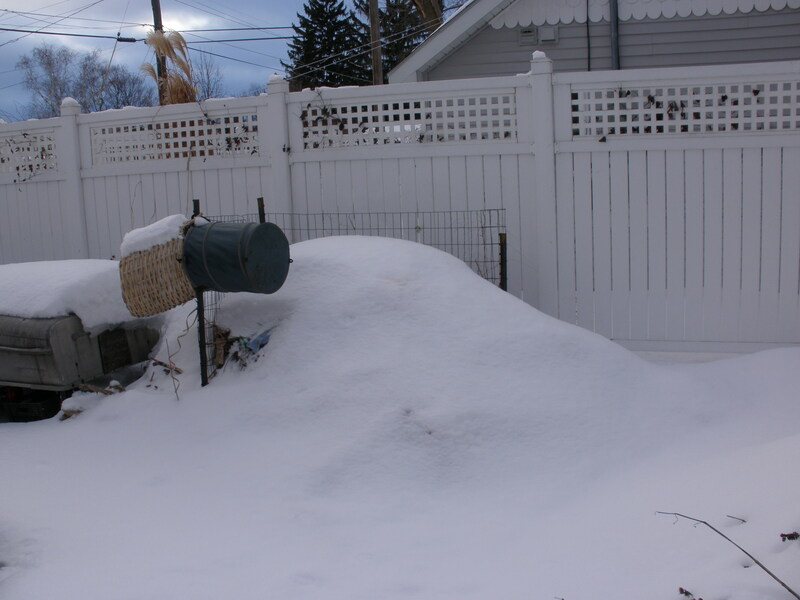 Compost heap buried under snow. The one on the right is full and working. The left one is nearly full. I'm going to get a third and make a three-bin compost system. But, several years ago I was introduced to vermicomposting. I have been in love with it ever since. Vermicomposting is a fancy name for “worm farming”. Yes, I am a worm farmer. I usually keep a worm bin at school and one at home. 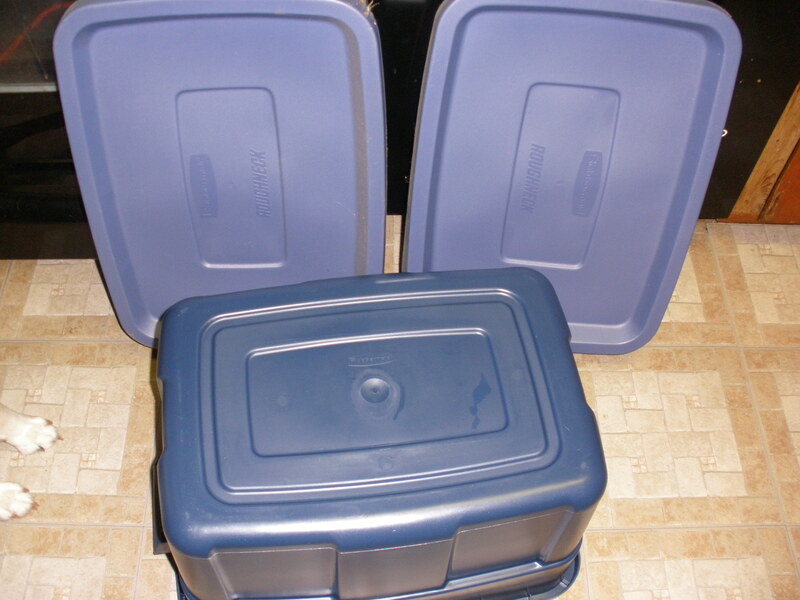 Right now I have both bins at home, but plan to return the old bin to school in the spring. In the summer I keep the bins in a shady area of the yard but for now they are in my “dining room”. (The realtor called it a dining room, but he was being generous. It is actually a wide hallway between the kitchen and the back entryway and more of a mudroom.) I’d keep the worms indoors all year, but for me they are just easier to deal with outside. I never have to worry about fruit flies, and I get six square feet of floor space back. There are lots of things I love about worm farming. The biggest reason is obvious: worms eat my garbage. Mary Appelhof wrote a book by the same title. Worms eat garbage all day every day. A pound of worms will eat a half a pound of garbage a day, or three-and-a-half pounds of garbage a week. Worms are more efficient than a compost pile. Worms eat garbage and turn it into rich compost in a very short time span. This compost is called “castings” which is just a fancy word for worm poop. Castings can be added to houseplants or garden beds. As I mentioned before, I often keep my bin inside. This makes vermicompost much more manageable for people with small yards. Even an apartment owner could compost using this system. I keep my bin out in open sight, but a bin could easily be tucked into a closet or cupboard. So convenience is a big reason I love my bins; you never have to leave the kitchen to compost if you keep the bin close by. You’re probably thinking, “Don’t they stink?” No, they don’t. A properly maintained bin smells like soil. The best thing about a worm bin is that it requires no turning. 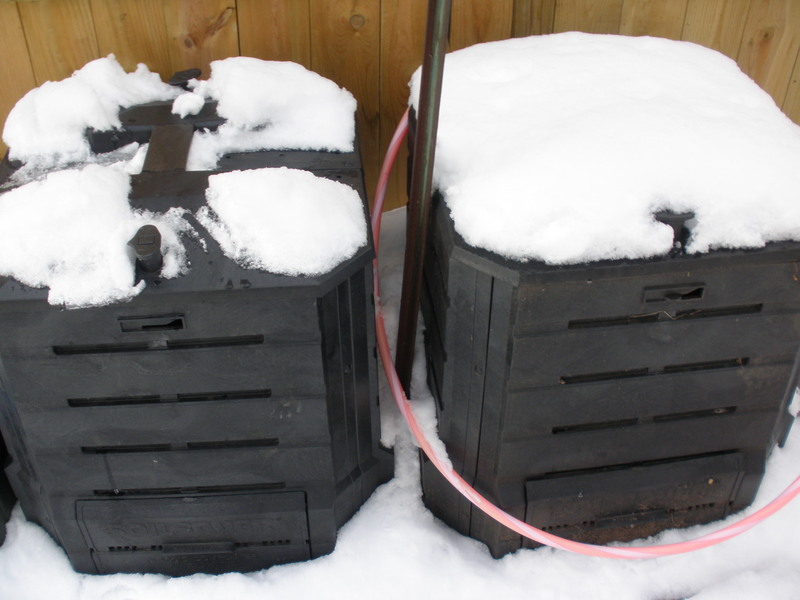 To get compost from a pile or bin in a reasonable time frame, the pile needs to be stirred or turned. If you have a small pile, this isn’t too difficult, but small piles aren’t as efficient as large piles. Large piles are faster, but are a real pain to turn. Worms actually prefer that you don’t turn them. So, now that you know why you should have worms, let’s find out how to raise them. There are a number of resources on the internet to help you get started, but let me walk you through the basics. First you need to provide suitable habitat for your worms. There are many vermicompost systems available for sale and for a fee, I’d be happy to build one for you but it’s pretty easy to do yourself. 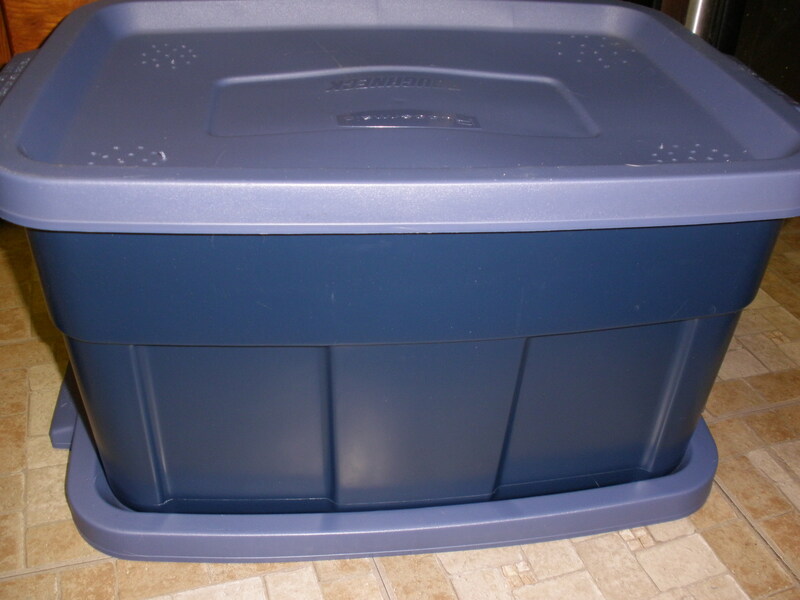 You’ll need a plastic storage contanier and two lids, a drill and a 1/8th inch bit. The plastic tub must be opaque; worms don’t like light. Scavenging extra lids can be a problem. I had these two left over from when I built my newest, deluxe, three-tiered worm bin. Flip the tub upside down and drill drainage holes in the bottom of the tub. Make sure you drill the holes in the low spots of the tub or liquid will pool in the bottom and create less than ideal conditions for your worms. Bottom of the bin with drainage holes drilled in it. 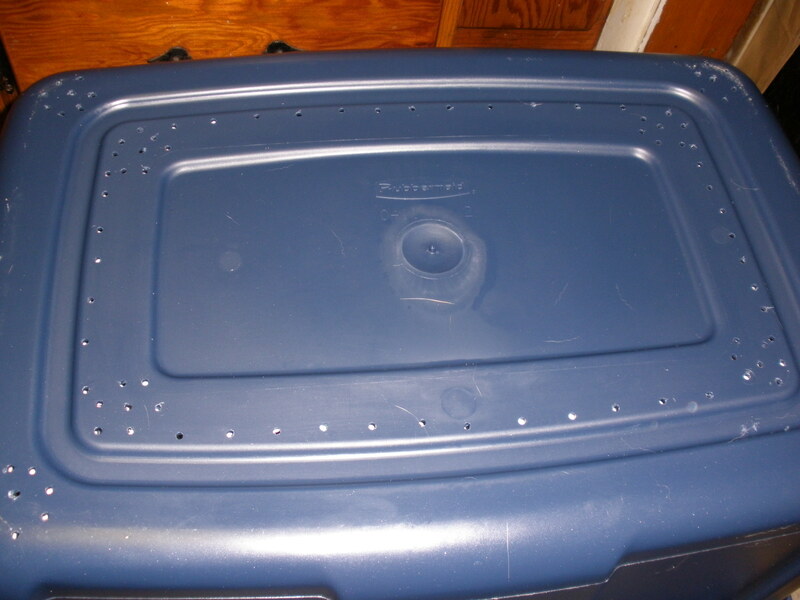 Once you have drilled the holes in the tub, turn it right-side-up and put ONE of the lids on it. Drill holes in the top to provide air flow to your worms. 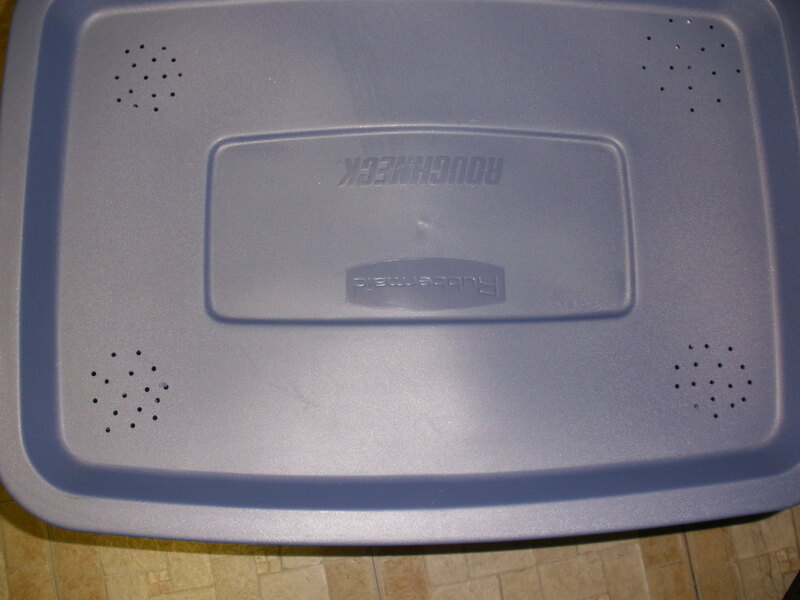 Worm bin top with air holes drilled in it. Now that you have a container for your worms, you need to fill it. Worms need bedding. Remember when you cleaned out your filing cabinet and shredded all your old documents?? Go get them and use them to fill the bin most of the way. 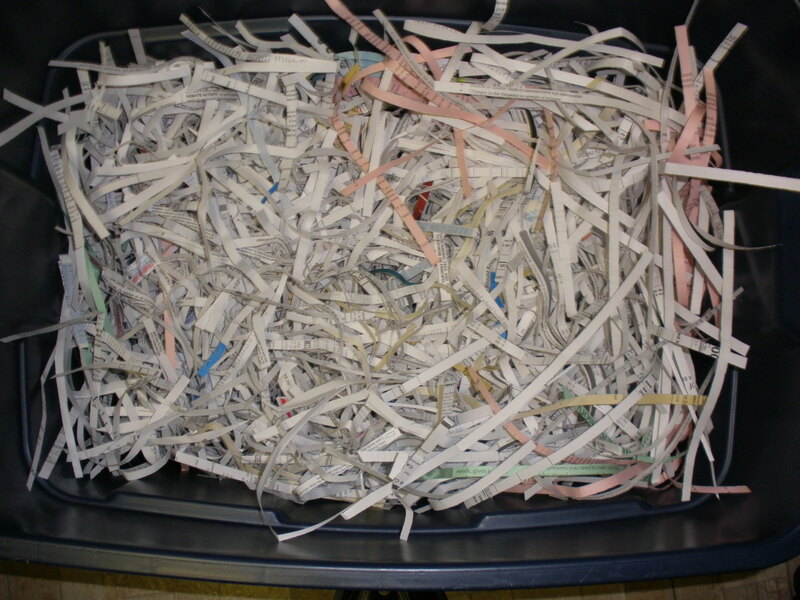 If you don’t have any old documents or junk mail to shred, you can use shredded newspaper or cardboard. Finished worm bin with bedding added. You are probably wondering what’s up with the extra lid. Unless you want water and worm tea dripping out the bottom of your worm bin all over the floor, you will need to invert it and place it under the bin as a saucer to catch drips. If you keep the bin outside, you won’t need the extra lid. If you haven’t been able to scavenge an extra lid, you can place your bin inside another tub or rig some other way to catch the drips. However, the extra lid is the easiest method. The finished worm bin. This particular worm bin was auctioned off at the Family Wisdom Conference's Wise Woman Ladies Night. Worms, like humans, are mostly water. The environment needs to be damp. If it isn’t, your worms will lose moisture through their skins, become dehydrated and die. We’ve all seen those poor worms dried out on the sidewalk after a rain; no good worm farmer wants to do that to his stock. To create the right humidity, dampen the bedding but DO NOT flood it. The bedding should feel like a wrung out sponge after you have added the water. If your bedding is too damp, either squeeze most of the excess out, let some drain out the holes before you add your worms, or add enough dry paper to the bin to absorb the excess moisture. If your tub starts to accumulate too much moisture, the worms will start trying to escape just like earthworms do after a rainstorm. Once your bin is established, you generally won’t need to add too much water but if the box ever seems dry, sprinkle a little water in until it seems damp enough. Most of the kitchen scraps you add are mostly water and will keep your box adequately moist. Adding a piece of cardboard, a piece of burlap or an opened newspaper to the top of your compost helps retain moisture, but I rarely do this. Now that you have a container and bedding, you are ready to start. Worms don’t have teeth. They have gizzards instead. In order to function properly, a worm’s gizzard needs small stones in it. A handful of sand or dirt from your yard sprinkled onto the bedding will provide enough stones for your worms to get started. Next, add some food for your worms. The worms will eat the paper you have provided for bedding, but they prefer rotten food. Rotten is the key word here. The worms actually eat the mold and fungus that consumes the food so the more rotten your food is, the better it is for the worms. If you don’t have any rotten scraps, fresh ones will do; they’ll rot soon enough. Don’t add too much food to your bin at first. Your worms will need time to adjust to their new surroundings. Once your worms become established, they will reproduce and will be able to eat more garbage. The more you feed them, the more worms you will have. You are finally ready for your worms! Believe it or not, there are many, many types of worms. The common earthworm, nightcrawlers or bait worms you buy at a fishing shop are not good for your bin. They don’t eat enough garbage and will probably die and smell up your bin. Your worm bin needs red wiggler worms. There are many sources for worms online. Most of these sources are very pricey. If you are in the Traverse City area, I’d be happy to sell you a pound of mine for $20, but at the moment I am not set-up to ship worms and I wouldn’t want them dying in the mail. Now that you have your bin set up and the worms have moved in, what should you feed them?? After a while, the bedding and food scraps in your bin will be unrecognizable because they will have been turned into rich castings. When this happens, you will need to harvest your castings because worm castings are toxic to worms. What? You wouldn’t want to swim in your feces, would you? Check back soon for a post on harvesting your castings! I have two (sometimes 3) compost piles in my TC yard. Instead of a nuisance, I view turning the piles as my weight lifting program. I also hand sift it before using which is really a workout. There is a bunch of us weirdos in Traverse. I have a frame with wire mesh in it that I throw the compost at and then I scoop the “sifted” compost out from under the screen. And yeah, there must be something in the water ‘cuz almost everyone I know is just as crazy as me. I’m new to TC but know how to compost with red worms and need a good local source. Please email me with contact info for buying some worms to get going in town. I’ve been saving a lot of egg shells to help my new worms grow and multiply and have enough compost food and Rubbermaid bins to get going this week. Thanks. PS My wife enjoys yoga too!! do you still live in the area, and might you still have some available for sale? i would appreciate it so much if you could get in touch!